When the Bauhaus school was created in 1919, its founding manifesto stated that 'architecture was the fine arts' ultimate goal ("Das Endziel aller bildnerischen Tätigkeit ist der Bau") However, initially architecture was not taught at the school itself. 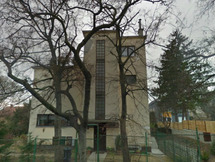 Instead, the founder of the Bauhaus, Walter Gropius trained Bauhaus students in its own private architecture practice. 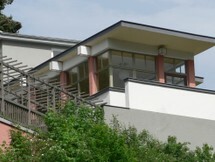 This collaboration produced important Bauhaus works like the Haus am Horn in Weimar, but plans for a Bauhaus estate in Weimar were not implemented. Only when the school moved to Dessau, and Gropius started with the construction of a Bauhaus building there, architecture moved to the forefront of the school's curriculum. The Bauhaus building in Dessau erected from 1925 remains today one of the landmarks of modern architecture and closely links the Bauhaus to the emergence of the discipline. Unfortunately this can also obscure the fact that the Bauhaus was a holistic concept that comprised all aspects of arts and craftsmanship with architecture functioning as its uniting element. This was Gropius' mantra when he conceived the building in cooperation with Carl Fieger and Ernst Neufert. Although Gropius constructed the building with his office, the Bauhaus workshops were instrumental in the design of the interiors. The project was financed by the city of Dessau. In the building design, Gropius developed ideas that he had already applied at the construction of the Fagus Factory which he built with Adolf Meyer before the first World War. The glas facade or curtain wall is the central design element which defines the buildings aesthetics. It is suspended in front of the load-bearing framework and openly shows the constructive elements. Gropius allowed the glass surface to overlap, thereby creating the impression of lightness. Alas, the construction proved unpractical for its inhabitants. The students were too hot in summer and too cold in winter and the curtain wall had to be supplemented by textile curtains. However, this does not effect the clarity, lightness and industrial rigor which the curtain wall evokes and which contributes to its unique beauty. Another important design element, is the separation of the building parts according to their functions. Wings of the buildings are arranged asymmetrically. In order to appreciate the design of the complex, the observer must walk around the whole building. There is no central viewpoint. The different blocks of the complex comprise the workshop wing with the glazed curtain wall, student house with studios for the students and its incisive exposed balconies, the unassuming block for the vocational school, a bridge between workshops and vocational school which houses the administration and the Festebene (event area), a place for meetings and events which connects the workshop wing to the student house. You are absolutely right. Thnak you for your careful reading of the text. Are you sure that "the students were too cold in summer and too hot in winter"?